Happy Tuesday. I’ve finished two knitting projects in the past few weeks (this is pretty major for me) and I’m looking forward to a winter of knitting near my toasty woodstove(s). I have some yarn in the stash that I really, really want to work into something fabulous over the next few months. I had some fun on Ravelry daydreaming about what I could do with a few of these amazing yarns. I have a drawer filled with little things I can’t bare to part with, but don’t really have a home elsewhere. Lost pieces from a game, campaign pins, special stones, dice, prizes from cracker jacks, stray pieces of jewelry, buttons, gumball charms, Indian head pennies-all end up living together in that drawer. I go through it on occasion and check in on all my lovely finds. Yup, still keeping ‘em. I’ve seen some excellent examples of these little, lost, miscellaneous pieces incorporated into jewelry. I love that it gets them out of a drawer and in to view. Check out this imaginative jewelry that celebrates precious odds and ends. Panel Q-and-A: What’s your favorite part of your job as a beader and jeweler? What’s your favorite part about your job? Your least favorite part? We’d love for your voice to be a part of this space. Please click on the number in the Comments bubble in the upper right corner of this post and leave a comment with your answer! I asked this same question of the beaded-jewelry superstar authors in Lark Jewelry & Beading’s Beadweaving Master Class series. We’re having a weekly Q-and-A with these six master teachers in a panel-style format on this blog each and every Monday. Enjoy, and whether you’re a jeweler, beader, general crafter, or just plain folk like me (as I’m frequently described), please do leave a comment with your own answer to each question! I love the design process: the spark of an idea, the picking of colors, and the engineering of the components and connections. I also love introducing the finished design to other beaders through my teaching and writing. Least favorite? I am not entirely fond of the inventory process required to manufacture kits, although the zen of putting beads in little bags and the making of a pretty package are all good parts of kit-making. Sitting in the studio in my Arne Vodder chair, an audio book playing, sparkly water within reach, stitching away with needle in hand and on an uninterrupted roll is what I really love about what I do. Walking to work or in downtown Santa Cruz on my lunch or a weekend walk on West Cliff along the Monterey Bay, I have urges to bead around passing objects. Images of beadwork inspired by the surroundings materialize and evaporate with each step. Letting go of the idea flow sometimes leaves me with an empty feeling. I realize I will not have enough time on this earth to bead as much as I would like. Favorites: Getting an idea and seeing how it works out, and buying beads. As we celebrate the season of giving thanks and head into the season of giving, this can be such a full and busy time of year: we plan for Thanksgiving in its many forms; we reflect on our love of family and friends; we turn inward to the coziness and warmth of our homes; and we think of gifts to create which celebrate a season of light and love. It’s enough to fill half the year, and we end up squeezing it between Halloween and New Year’s—what a fast-paced holiday season it can be. It’s often a choice to feel and be busy right now: maybe you know what I mean—maybe you’re checking off a holiday to-do list right now (stocking stuffer for Jeff, coconut macaroons for vet office) or possibly a new one is sitting next to you as you read this. Though who knows, maybe you’re blissfully enjoying a holiday count down without a sense of pressure or deadline (um, if you are, please come help me bake cookies). Wherever you are on the Busy Spectrum, I’d like to share this idea and question with you: does your checklist include the name of someone in need? Amidst the excitement and comfort of the holidays, we have an opportunity to give in so many ways—our time, our creativity, our hospitality, our love. In what ways might we also contribute those gifts to organizations founded on the principle of helping others? Earlier this year I was fortunate enough to work on Craft Hope: Handmade Crafts for a Cause—a book that thoughtfully pairs instructions for handcrafted projects with charities in need. Working with its author, Jade Sims, and the incredible designers featured within its pages was a privilege, and I was constantly inspired and touched by their innovation and generosity. My eyes were also opened to the missions of dozens of charities profiled in Craft Hope. From cancer treatment centers to adoption nonprofits, Craft Hope suggests ways in which we can reach out locally, nationally, and globally through the simple act of sharing handmade creativity with others. To spread the seeds of inspiration, I’ve listed below some of the charities profiled in Craft Hope. I encourage you to visit their sites and find out how you can add your compassion to their cause this holiday season. To celebrate this season of giving, we’re giving away a copy of Craft Hope: Handmade Crafts for a Cause. We hope it inspires you to share your time, creativity, and love with those in need of care, a helping hand, and hope. To be entered for a chance to win a copy of Craft Hope, leave a comment on this post by 9:00 p.m. EST on Monday, December 6th. You’re welcome to post any comment, though I’d love to hear how you plan to celebrate this season of giving. One winner will be selected at random and contacted by Friday, December 10th. Click here for the official rules. Last week, I posted images of nine projects and asked you to vote on which one you’d like me to give instructions for next. Well, the polls are closed and the people have spoken: two projects—the Anemone Choker and the Rajah Bangle—tied for first place. Click here for a PDF of the Anemone Choker instructions and here for the Rajah Bangle instructions. Both are from the book Contemporary Bead and Wire Jewelry. And come back next week for free instructions for our runner up, the Follies Chandeliers. Happy Thanksgiving. Don’t overeat…but if you do, take a nap. Happy holiday weekend, crafty compadres! I hope you all had a peaceful, stress-free and delicious Thanksgiving. 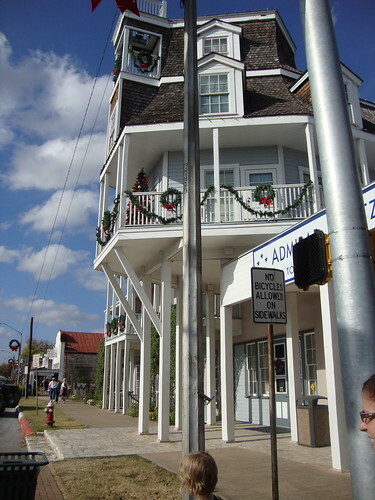 Ours was just that, as we were fortunate enough to be able to escape to the Hill Country of Fredericksburg, Texas, with our close family friends. Although we only had to travel about an hour and a half away from Austin to get there, the small town charm and outlying rural ranches, made it feel like a world away from the city. 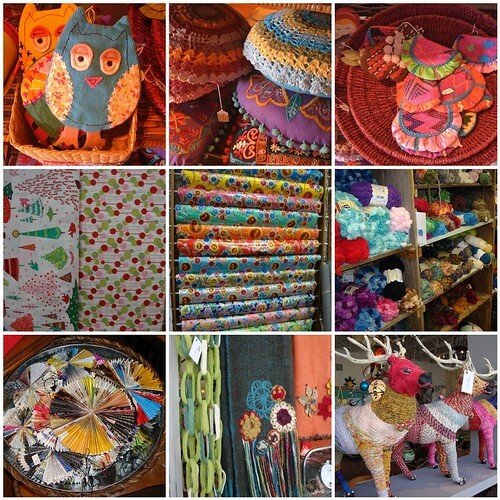 Fredericksburg with it’s vineyards, bed & breakfasts and vista views, is a lovely getaway destination but one of my favorite things about our visits there, are all of the handmade finds that are tucked away in the many boutiques. Even the agency we stopped at to pick up the keys for our rental house, offered crocheted & embroidered pillows and fabric scrap coin purses! My favorite retail stops though, are Things in a Room (a hodgepodge of this and thats which includes a fantastic collection of fabrics, vintage trims, yarn, and embroidery supplies), and the gorgeously styled, Red (a house of “modern lines, vintage finds and custom designs”) — so this week, I thought I’d take you on a virtual tour of just some of the craftiness I came upon in these sweet, little shops. Enjoy! Spend your turkey day in stitches with a sweet little themed collection of Thanksgiving motifs (from silverware to pie to the toast!) from Aimee Ray’s Doodle Stitching: The Motif Collection. Simply print, transfer, and use them at their current size or enlarge them in your reader window and print “current view.” Embroidery is perfect for toting along with you wherever your travels take you this holiday… and how else will you fill the time between the main course and dessert! Happy stitching! And happy Thanksgiving from Lark Crafts! There were many delightful surprises packed into last Saturday’s Lark Jewelry team trip to Winston-Salem, North Carolina. At the annual Piedmont Craftsmen Fair, we met many jewelers, saw amazing new work, chatted with project designers and gallery artists, bounced around new book ideas, and even worked in a bit of holiday shopping. We spent what was left of our day strolling the Downtown Arts District, having a delicious lunch at Sweet Potatoes, and visiting Jack Jennings in his studio. Megan Clark’s pieces featuring stingray leather were show stoppers. Megan has impeccable technical skills and a great design sensibility. Definitely one to watch! Lisa Klakulak showed a very impressive collection, including an innovative design for hoop earrings. A recent stay in Mali gave rise to some new motifs and forms, and Lisa has also begun to include small mirrors in her jewelry. Vickie Howell’s giveaway is a hard act to follow (so much good stuff! ), but we wanted to post a giveaway before the holidays for all those weekend blog readers that might come on over only to just miss the deadline on the birthday fun. And what better treat for the season than Vintage Fashion Knitwear! For those of you who didn’t see Valerie’s post last week (right here), this newly released book is a coffee-table worthy collection of knitwear design. It follows hand- and machine-knits through 100 years of history with no shortage of irresistible, iconic fashion photography. We’ve got two copies to give away…To enter for a chance to win one copy, leave a comment on this post by 8 p.m. EST on December 1st. Any post will do, but we’d love to hear your first memory of “fashionable” knitwear—it could have been on the runway, in a store, or even just on a friend. Or if you went shopping, tell us what knitwear caught your eye! Two winners will be selected at random and announced on December 2. Click here for the official rules.